Donald Trump Thursday accused Hillary Clinton of making "one of the most brazen attempt at distraction in the history of politics" and attempting to "intimidate" and "bully" voters with her charges that he is fomenting racism with his campaign. "What does she do when she can't defend her record?" 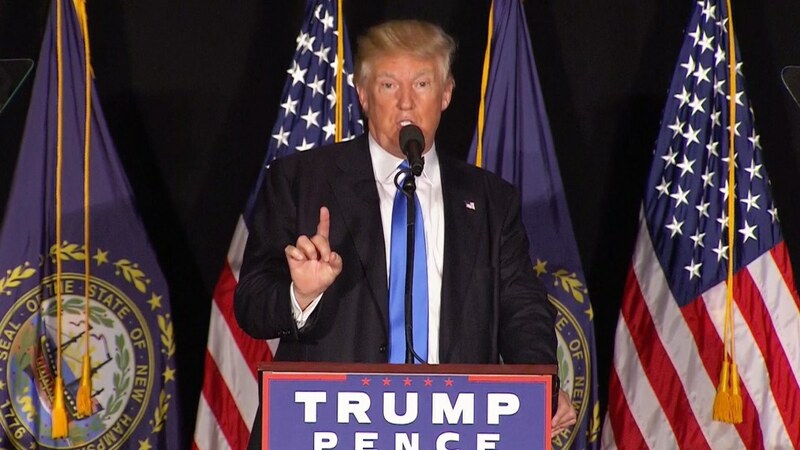 He asked a relatively small but enthusiastic crowd in New Hampshire. "She lies, she smears, she paints decent Americans as racists. She bullies voters, who only want a better future, and tries to intimidate them out of change." Trump later declared: "To Hillary Clinton, and to her donors and advisors, pushing her to spread her smears and her lies about decent people, I have three words: Shame on you." The crowd, filling half a hotel ballroom in downtown Manchester, N.H., chanted those three words along with him. It was a vigorous prebuttal to Clinton's speech Thursday highlighting Trump's outspoken support from self-described white nationalists and other extreme subsets of the far-right fringe. Speaking an hour before she was slated to go onstage in Nevada, Trump told the crowd he initially didn't want to "dignify" the attacks, but felt he needed to respond because she was also accusing "the millions of decent Americans who support this campaign" of being racists. The attacks, Trump argued, were "the oldest play in the Democratic playbook" -- the "one tired argument" left for Democrats when their policies fail. "They keep going back to this same well but the well has run dry." Trump's advisers have said they see Clinton's new line of attack -- which highlights Trump's support from KKK members and other controversial white supremacist figures, among others -- as a sign of desperation, and an attempt to distract from a week of bad news. Clinton has faced fresh questions this week about her use of a private email server while at State, and the interactions she had with donors to her family foundation while she was Secretary of State. But it also comes as Trump is attempting to reboot his campaign with a concerted push to appeal to minority voters, part of an effort to make up lost ground to Clinton over the past month. Democrats believe highlighting Trump's controversial supporters could stymie that effort early. On the stump this week, Trump has argued Democrat governance and policies have failed minorities, asking them to give him a chance. "What do you have to lose?" Trump asks. He kept up that drumbeat in New Hampshire, arguing Clinton was attacking him as racist to paper over her record. "She supports trade policies that have closed factories in African-American communities ... policies in crime that make communities less safe," Trump declared. "She doesn't have one single proposal that hasn't been tried and failed," he said. And because she can't defend her record, Trump argued, "she lies, she smears, she paints decent Americans as racists. Just watched recap of #CrookedHillary's speech. Very short and lies. She is the only one fear-mongering! But he broadened his defense against charges of racism beyond his own campaign and supporters to the wider Republican Party and traditional GOP policy proposals. "People who want their laws enforced and respected, and who want their border secured, are not racists," he said. "People who speak out against radical Islam, and who warn about refugees, are not Islamophobes." And "people who support the police...are not prejudiced," Trump said. Trump also likened Clinton's charges to attacks used by opponents of the successful Brexit campaign, arguing that like Brexit supporters, his supporters wouldn't be intimidated. "It didn't work there. It won't work here.," he said. "The American people are ready to vote for freedom, opportunity and justice. They are ready to take back control of their own futures."